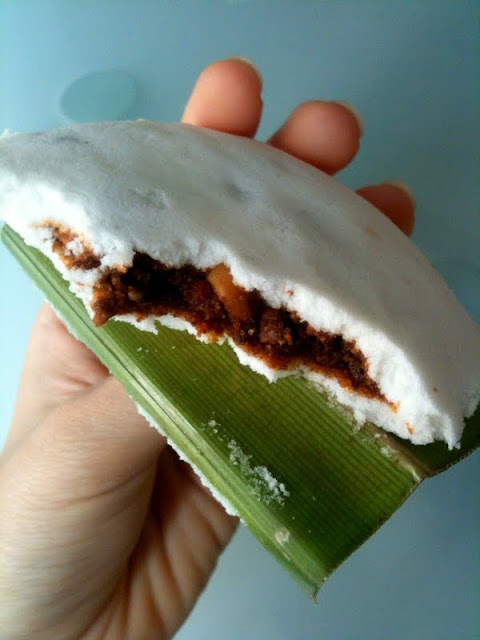 Tutu Kuehs are one of my favourite desserts/snacks. Peanut ones to be more exact. It’s a pity good ones are so difficult to find these days! These palm-sized babies are much bigger than the usual, and so much more scrumptious too! Dad bought some home for me from Beo Crescent Food Centre after a major haul of fruits from our fruit seller in the market next door. They were still warm, freshly made just minutes ago. While the coconut one was good- fragrant, and not too sweet- it was the peanut one that had me reaching for seconds. The filling was buttery and sweet, with the occasional bits of unevenly chopped peanuts to add to the crunchy texture. 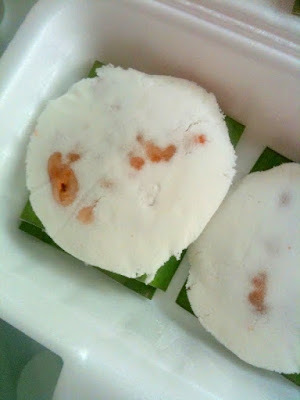 The kueh itself (I’m refering to the white bits) was so delicious as well, texturally a cross between powdery and cakey. For the same reasons why I prefer huge reeses compared to mini ones, I prefer these huge tutu kuehs more than the usual mini sized ones (the shop sells both). There’s more filling, and obviously more of the white-ish bit too. More of everything- what’s not to like? Dad told me that this guy opened his stall that day at 5.30am and everything was sold out by the time it was 2.30pm! If you want to try this delicious snack, be sure to turn up early.